Helen Humphreys is the author of four books of poetry, five novels, and one work of creative non-fiction. She was born in Kingston-on-Thames, England, and now lives in Kingston, Ontario with her dog, Hazel. Her first novel, Leaving Earth (1997), won the 1998 City of Toronto Book Award and was a New York Times Notable Book of the Year. Her second novel, Afterimage (2000), won the 2000 Rogers Writers' Trust Fiction Prize, was nominated for the Commonwealth Writers' Prize, and was a New York Times Notable Book of the Year. Her third novel, The Lost Garden (2002), was a 2003 Canada Reads selection, a national bestseller, and was also a New York Times Notable Book of the Year. Wild Dogs (2004) won the 2005 Lambda Prize for fiction, has been optioned for film, and was produced as a stage play at CanStage in Toronto in the fall of 2008. Coventry (2008) was a #1 national bestseller, was chosen as one of the top 100 books of the year by the Globe & Mail, and was chosen one of the top ten books of the year by both the Ottawa Citizen and NOW Magazine. Humphreys's work of creative non-fiction, The Frozen Thames (2007), was a #1 national bestseller. Her collections of poetry include Gods and Other Mortals (1986); Nuns Looking Anxious, Listening to Radios (1990); and, The Perils of Geography (1995). Her latest collection, Anthem (1999), won the 2000 Canadian Authors Association Award for Poetry. 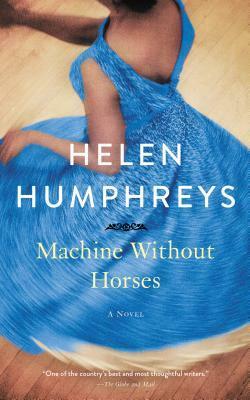 Helen Humphreys's fiction is published in Canada by HarperCollins, and in the U.S. by W.W. Norton. The Frozen Thames was published by McClelland & Stewart in Canada, and by Bantam in the U.S. Her work has been translated into many languages.